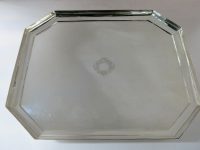 English, sterling silver Deco, large octagonal handwrought footed tray, measuring 22" x 18". Made by Peter Guille, London 1941. Hallmarked on underside. 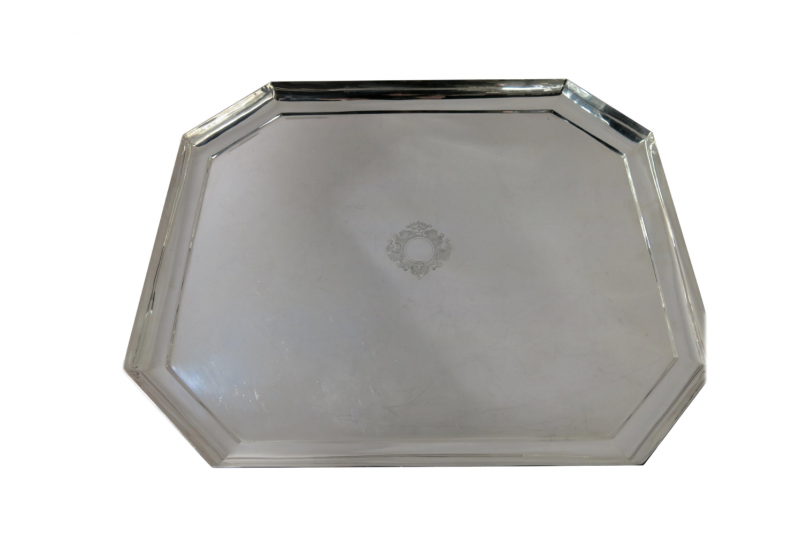 Great as a drinks tray, food serving tray or even as a table centrepiece. Tray weighs 4.370 grams. Peter Guille originally was the vice president of Crichton & Co, silversmiths circa 1925, before taking over the shop in 1936 and manufacturing fine silver under his own name. Like Crichton, Peter Guille made excellent examples of fine English hand forged silver, and continued as a silversmith until 1953 when he then became vice president of the Robert Sterling Clark Foundation until his death in 1966. Robert Sterling Clark had been a collector & client of Crichton's & Peter Guille for many years.